The Australian-born engineer R.G. McLeod moved to North-London prior to WWII. During wartime he was supervising engineering of tools for aircraft-production and became Captain. He died in November 1986 aged 94. About bodies for motor cars he had very strict ideas. He preferred a saloon body to open motoring but insisted that as much vision should be there as offered by an open body. The car had to be as short as possible; if there was luggage it could be thrown on to the back seat - hence no need to carry the wasted space of luggage compartment, which most of the time was empty. For him a car had to be functional "one wheel at each corner", not particularly elegant. In 1934 R.G. McLeod purchased a Bentley 3 1/2 Litre, #B177AE, first registered AXN II, later he re-registered it with his personal registration H I. In Mr. Johnstone from H.J. Mulliner he found a man who didn't hesitate to create a car exactly to the sketches and ideas provided by R.G. McLeod. The design was for a close-coupled two-door saloon body with razor-edged top. Particularly large windows in combination with very slender pillars made for very good all-round visibility. A large rear light and a fixed glass panel in the roof's front part - similar to H.J. Mulliner's "high-vision" added to an atmosphere of almost open motoring. Just to prior to WWII R.G. McLeod arranged for the body from #B177AE to be transferred onto his new overdrive Bentley chassis #B142MR. On the shortened wheelbase there stood what was in fact a most unusual two-seater, though rear seats were provided; offering the provision to remove either half or both sides of the rear seat. After an interlude with Lancia and Citroen motor cars during the immediate post-war period R.G. McLeod's interest in Bentley revived and he commissioned H.J. Mulliner to produce a new body for his 1947 Bentley Mark VI, #B22AK. From the chassis 9 inches were "chopped-off" to make for minimal overhang. The basic design showed a very close resemblance to the body from the pre-war time. However Capt. R.G. McLeod had found the wings on his previous Citroen Light 15 to be much to his liking and asked H.J. Mulliner for the wings on his Bentley Mark VI to be to the pattern of the Citroen. When the Bentley Mark VI with the bigger 4 1/2 Litre engine was announced Capt. R.G. 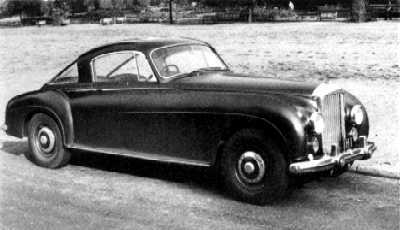 McLeod took chance of solving the problem of not having been particularly pleased with the steering of his 1947 Bentley and getting a more powerful engine by substituting #B22AK with a new 1952 Bentley Mk VI #B50MD (MD being the first series with bore x stroke 3 5/8 in x 4 1/2 in, capacity 4.566 cc). He decided on H.J. Mulliner as coachbuilder again: With basic lines of Mulliner's 'Lightweight' design but with a considerable shortened boot he had a compact 4-Door Saloon built there. Capt. McLeod had the car reg'd H1 and retained his personal registration for his next Bentley; hence #B50MD later was re-registered 9EMX. It is not correct that this car had the body with some slight alterations transferred from #B22AK (as quoted erroneously by some sources). The car is in the custody of an American collector who kept it in fine fettle over the recent three decades. Destroyed by fire ca. 1960 was the unique body which H.J. Mulliner in very close conjunction with Capt. R.G. McLeod had erected on chassis #BC50D. This was a 1955 Bentley R Continental with 4.9 Litre engine. For years it was thought that but H.J. Mulliner's drawing had survived. However one photo of a three quarter rear view did appear in J. Green's Bentley Fifty Years of the Marque. And at least thanks to H.G. Cramp having employed his camera at a meeting in 1956 photos of three quarter front and three quarter rear views became available. These are a testimony that R.G. McLeod's design ideas had been blended in quite attractively with H.J. 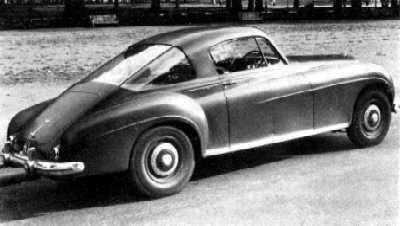 Mulliner's styling of a fastback saloon (though the large dimensioned rear window had given them some headache). There were quite some question marks as regards the 1960 Bentley S2 Continental, #BC106AR, which was the next in the string of shortened McLeod Bentleys. Existing photos by Rolls-Royce Ltd., London Group, were captioned "Experimental Bentley". It seems by far more probable that the 1960 Bentley S2 Continental, #BC106AR, was the last one which has been bodied solely by H.J. Mulliner. This company had been taken over by Rolls-Royce in 1959 which might explain for the photo-series of this particular car to be filed with negative-numbers L9743 to L9746 by Rolls-Royce Ltd (no doubt about this car being shortened McLeod Bentley as the car bears his personal registration H I). H.J. Mulliner once more had been commanded to "chop-off" what the client described as unnecessary length. This was achieved by cutting away the rear parts of the frame, using another petrol-tank and repositioning the battery to name but a few alterations. The last car was not bodied by H.J. Mulliner but in conjunction with F.L.M. Panelcraft, it was a 1964 Bentley S3 Continental, #BC38XC. From the photos of this car it becomes clear beyond doubt that an existing H.J. Mulliner, Park Ward Fixed Head Coupé body to "Koren-Design" (sometimes described as "Chinese Headlamps") had been subject to major alterations. A large perspex sunroof had been fitted, though a fixed one with no opening mechanism. The front of the car was almost unaltered with the exception of overriders to Harold Radford design, i.e. with rubber insets at the top. The rear however was with minimal overhang and surprised with a fastback design of rear light and tailgate whereas the rear wings were styled almost like fins.